Coaches are some of the most important people in the lives of children and young adults. They teach meaningful lessons, they lend a caring ear and a helpful boost up, and they help shape our children’s personalities for years to come. At TeamSnap, we think youth sports coaches are truly some of the most important people in the world. It’s why we are grateful for the coaches we had, the coaches our kids currently have and, in some cases, the coaches we are. With this sentiment in mind, we’ve once again proudly sponsored the Positive Coaching Alliance’s Double-Goal Coach Award. The Double-Goal Coach® Award, now in its 15th year, is one of the highest honors a U.S. youth sports coach can receive. Positive Coaching Alliance (PCA), a national non-profit built developing “Better Athletes, Better People,” works to provide all youth and high school athletes a positive, character-building youth sports experience, and that’s a mission TeamSnap supports fully. The Double-Goal Coach® Award is named so because it honors coaches who pursue both wins and the more important goal of teaching life lessons through sports. Take a look at this video featuring Lawrence “Trooper” Johnson, one of last year’s winners — shown at the PCA event, where he accepted his award for a glimpse at the kind of exemplary coach the PCA Double-Goal Coach® Award honors, then consider nominating an inspirational coach you know. 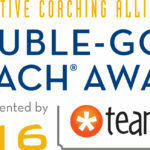 The 50 national winners of the 15th Double-Goal Coach® Award will each receive $200, a certificate, recognition in PCA’s website, social media, newsletters and media campaigns; and the chance to be one of a few winners to receive an all-expenses-paid trip to accept the honor in California during PCA’s National Youth Sports Awards Dinner and Auction Presented by TeamSnap. The schools and organizations that the award-winning coaches serve receive national publicity from the award, which also provides the opportunity to hold the coach up as a great example for other coaches to emulate. The deadline to nominate a coach is Dec. 31, 2015. Please take a few minutes now to nominate a special coach in your life and pass along the word to others. Let’s celebrate our coaches; they deserve it! Stephanie Myers is the Senior Marketing Manager for TeamSnap. When she’s not manning the marketing department’s helm, you can find Stephanie playing lawn games or working on her 95-year-old craftsman home in Memphis, Tenn.